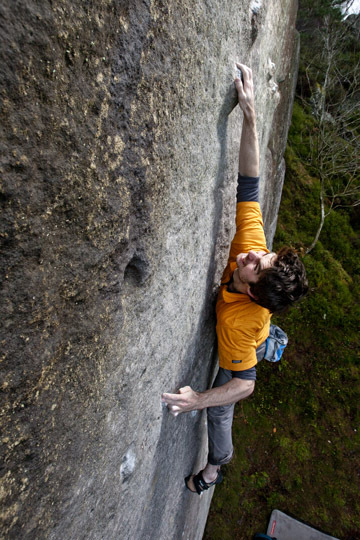 A couple of years ago, every time I saw Chris Graham he was raving about this route he was trying called 'The Young' up at Callaly, a beautiful set of buttresses deep in Thrunton Wood. 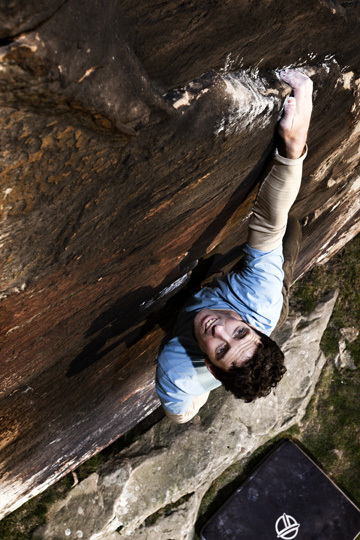 It was first climbed by Andy Earl and, surprisingly, has waited ten years for a repeat. 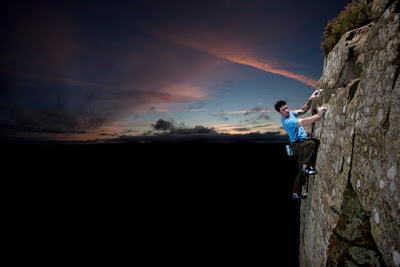 I'd never been up there until I dragged Andy up for a photo session, and I was blown away by the 'Tombstone Buttress'. The photo in the guidebook just didn't do the route justice (sorry John!). Dan had told me it was at the top of his 'to do' list and he was determined to give it a go while he was up a couple of weeks ago. Amazingly, when we arrived, we found that the route was in perfect condition. The rock either side was seeping slightly, but the route itself was dry. Dan set about working the crux sequence on a rope and it wasn't long before he found a slightly easier way of doing it. Having seen Andy on it, he was certainly playing to his bone-crushing finger strength by making a cross through to opposing, shallow pockets and moving up from there. 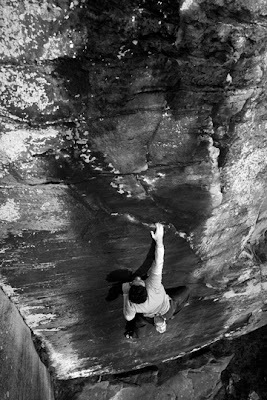 Dan ended up making a long move from one of these holds and could just get his fingers onto the poor sloper above. After matching on this, it's a series of tenuous, balancy moves on some weird looking 'pancake' features to the top. I don't think I've seen Dan so happy as when he topped out. He couldn't stop smiling and there was plenty of adrenalin, due mostly to the topping out procedure not quite going as planned. For all the gory details (and Dan's comments about The Young) head over to the Beastmaker blog. After relaxing for a bit and revelling in the glory, he repeated the crux move a few times for photos. He was loving it! He couldn't stop raving about the quality of the climbing and how incredible the route is. Dan has done a lot of hard problems and he reckoned this was the best of them all. It certainly deserves more traffic, and Dan vowed to return with some of the Peak crew to show them what they've been missing. All afternoon, there was a mysterious wood-knocking coming from the forest. After much careful consideration, it can only be attributed to the presence of a Sasquatch living in Thrunton Woods. Dan assumed it was working The Young and wasn't happy with us being on its project, but I shall pass the matter on to Graeme Read, who is the local authority on Northumberland big cat sightings and Bigfoot activity. Last weekend I was up at Bowden with the unstoppable force of nature known as Andy Moir. It was another day where it was raining on Tyneside and no-one could muster up any enthusiasm to go out. I drove up to meet Andy and was pleased to see a line of blue on the horizon. When we arrived at Bowden it was like a hot, summer's day! Perfect weather. I really wanted to photograph Andy on Crater Maker. 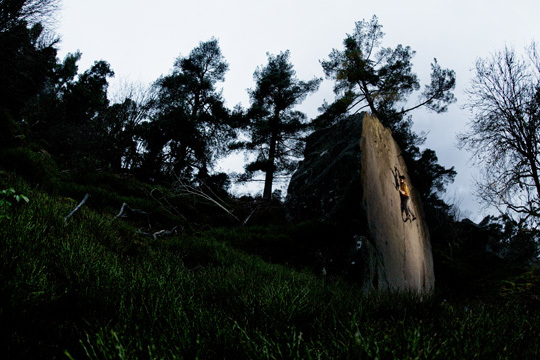 It's a great route with some fantastic, bouldery moves up the sloping ramplines at the start. Have you ever seen anyone on it? It rarely gets done, and I have no idea why. It gets E4 in the new guide, but it's soft at that grade. Saying that though, when I did it, it nearly resulted in a helicopter ride. I was right at the top when a hold snapped. I started barn-dooring, and only just managed to grab a hold and stop myself coming off. I was very lucky. It was in the days before mats, and there's a lovely spine-breaking rock platform underneath the route. 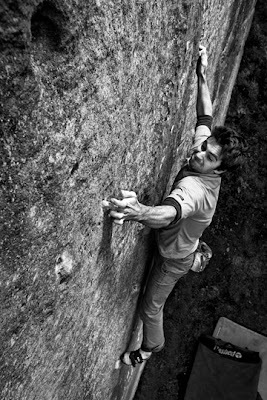 It was a while since he'd done the routes at the end of Main Wall, so he did a few of those to finish.